Long bambi-esq lashes are what we girl’s dream of at night, yet very few of us are lucky enough to be blessed with a set of our own au-naturel ones. Whilst eyelash extensions, mascaras, lash serums and falsies are one way to achieve the look, a good set of eyelash curlers are what really lay the foundations for that doll-eyed effect. If you can afford to shell out £20 for a set of curlers then we implore you to invest, invest, invest in these. These curlers come with high praise from the majority of the beauty industry and have won a series of awards for being so darn good. 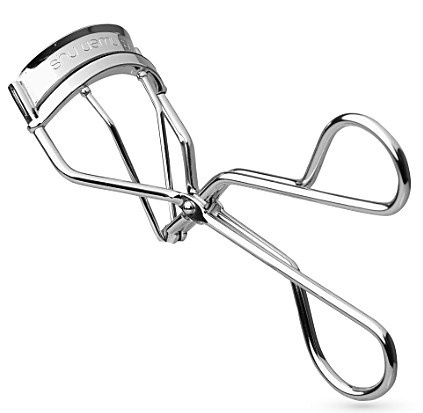 This curler is designed not to tug and pull your lashes and is even wide enough for use with falsies…bonus. The general consensus on the Shu Uemura curlers is that the curl holds for longer than many high street cheaper curlers, which is why many women are more than happy to pay the high price. This curler is a demi curler – meaning it is half the size so it can get to all of those stubborn tiny little lashes in the corner that your full size curler is unable to capture. Alternatively, you can just use these curlers on the end lashes for a winged and more natural but still wide-eyed look. Coming in as the cheapest of our selection this curler does not create the same dramatic effect as the Shu Uemeras or deliver the versatility of the Mac demi’s. However, for £6 they do the trick – giving a rather nice curl with relatively good staying power. A cut above other curlers available for the same price.